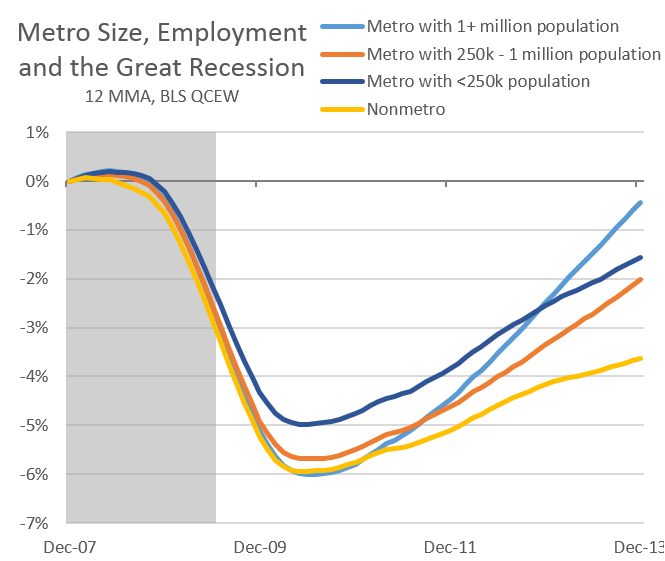 Just a quick update on employment growth by metro size, similar to previous work (HERE and HERE). This takes a look at county level employment data (QCEW through the end of 2013 was released recently) and categorizes it using the USDA rural-urban continuum codes. The largest metros (the 51 largest have a population of 1 million or more) have seen the strongest gains in recovery . The second set of metros have seen some acceleration and the nonmetro (rural) counties have seen deceleration over the past year. In terms of how these growth rates look from a historical perspective, I took today’s rural-urban codes and applied the same categorizations back to 1980 (so a place like Las Vegas which is big today but not then, is still classified as a large metro). What stands out are the largest cities outperformed other locations both in the late 1990s boom and today. However smaller cities and rural areas performed just as well, if not better than, big cities in the 1980s and somewhat during the housing boom. The question is what is the normal pattern of growth? Is is the 1980s and housing boom years where most areas grow about the same? Or is it the mid to late 1990s and so far in the 2010s where larger cities outperform? It’s certainly an open ended question, but most outlooks call for continued urbanization of the population and for metro areas to outperform rural economies in general. This is at least partially due to the fact that all those good economic things — agglomeration effects, knowledge spillovers, clustering, etc — happen in certain locations, which are usually bigger cities. The case could also be made that the housing boom was an equalizer in which small and medium sized metros outperformed due to stronger population growth and the associated housing demand and activity that went along with it. This stronger growth also may have pulled some away from the larger cities at the same time. In this version of the story, today’s pattern of growth is simply a return to the expected one, which was interrupted by the housing boom where inflated asset prices/wealth may have impacted location decisions. It is also interesting to note that only the largest cities have seen growth rates return to pre-recession levels, while the others lag. This is at least partly due to the nature of the Great Recession in which housing and government have been large weights on the recovery. These jobs also play a disproportionately large role in many medium, smaller and rural economies than in big cities. Not because these areas have so many of these types of jobs, but rather because of lower levels of industrial diversification, that generally occur in bigger cities (ballet dancers, advertising firms and the like). Breaking these big cities down into more groups reveals the same trends. Large cities with populations of, say, 4 million or more compared with those with populations of 1-4 million have the same employment trends over the Great Recession.